St. Patrick's Day Pancakes - Green Veggies, fun for kids!St. 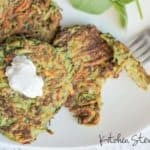 Patrick's Day Pancakes - Green Veggies, fun for kids! optional other veggies – you can replace some of the white potatoes with zucchini, carrots, or other root vegetables. Wash, peel (optional) and grate the raw potatoes (all). I use a food processor! Salt the gratings and allow to sit for 10-60 minutes (depending on how long you have before the meal), then drain the excess water that accumulates at the bottom of the bowl. If you’re hurrying and must skip this step entirely, the pancakes will survive. Food process (with the regular blade) or finely chop onion and add to shredded veggies. Food process the spinach and mix it in. Beat eggs well and add to the bowl (or just beat on top and then mix in). If it’s green, you’re good to go! Heat oil in frying pan or electric griddle at about 350F. I love my cast iron griddle (found on Amazon) and use it multiple times a day. Spoon potato mixture into hot oil and flatten with spoon or spatula to create 3-4” circles. Add a spoonful of the liquid that collects at the bottom of the mixing bowl right in the center. It’s mostly egg and will remind you of a fried egg around the edges of the pancake. Remove to a plate; drain with paper towel if necessary.